I began shaving for my yoga students. There I said it. I was 35 years old and had never shaved anything, ever, but I did this for them. Why? It’s the same reason I seek poems about God without the word ‘God’ in them to share at the end of my yoga classes. I want the yoga classes I teach to be completely accessible, without any triggers that might ramp up my students’ left brains and take them away from their own present experience of yoga. (This is also the reason that at rec centres I don’t ‘om’ before and after class, though at studios I ‘om’ to my heart’s content). Now, one might think that looking for ‘God’-less poems about God in a book titled ‘Love Poems From God’ might be a fruitless (and somewhat ironic) endeavor, but I beg to differ. I had previously discovered that Daniel Ladinsky’s translations of the poetry of Hafiz in ‘The Gift’ offered a healthy handful of poems for my use. 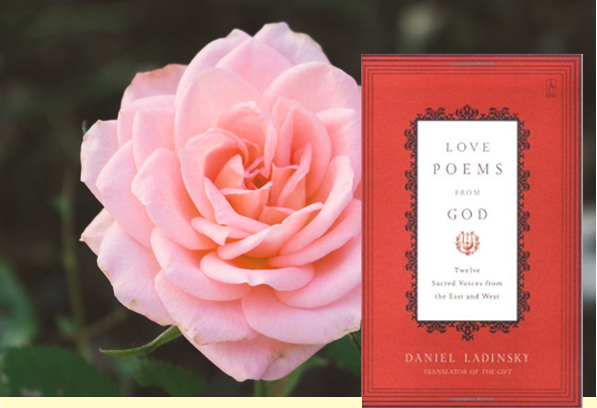 ‘Love Poems From God’ proved to be just as full of such divine seeds to plant in the fertile, post-savasana soil of my students open hearts and minds. Admittedly, I turn to this book often for my own solace and nurturance, and I draw deeply from all of the poems- ‘God’-less and ‘God’-full. Ladinsky has once again done an inimitable job translating a diverse range of poetry into a contemporary feeling anthology that traverses the spiritual traditions of East and West, as well as great swaths of time! By book’s end, what is made plain are two things- it’s all the same God, and it’s all about LOVE. So I offer you now a few “God”-less poems about God. lobbies every moment for contentment. is so fragile and shy. Kenzie Pattillo completed her 200 hour YTT at SSCY in 2002. She is a householder yogi/mama living in North Vancouver and currently teaches hatha, yin and restorative yoga in her community and at yoga getaways at the Centre. As an E-RYT 200, and having recently completed her 500 hour YTT through Semperviva Yoga College, she looks forward to joining the YTT asana faculty this summer at SSCY.